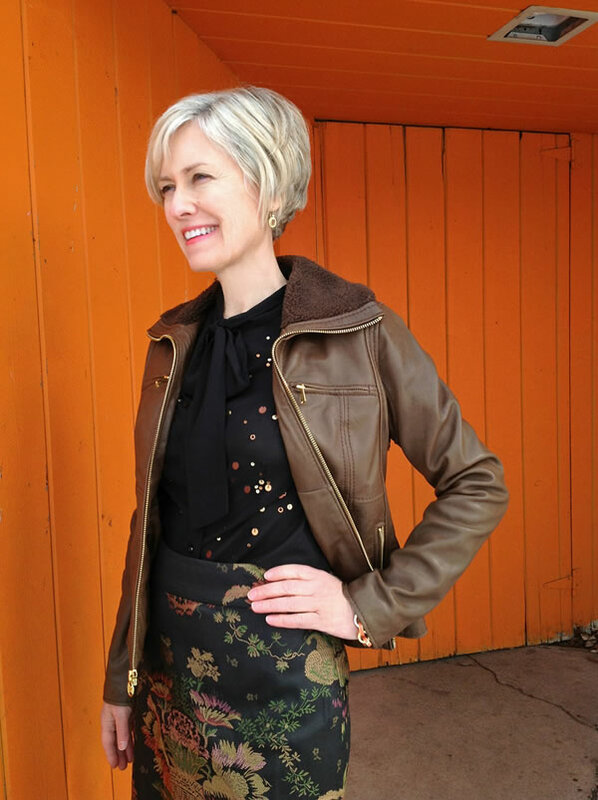 Ann is another blogger I discovered through my 40+ blogger community recently and I was immediately taken by her very creative outfits plus her amazing photos. Beautiful photos really DO make a difference and I’m so happy that bloggers such as Ann take the time and effort to make their photos truly special. The fact that she is an artist comes through in all her her creations and I’m certainly a fan! Time to discover both her style and hair secrets! Hi Ann. Thanks for taking the time out to answer a few questions for 40PlusStyle.com. Can you tell us a little bit more about yourself? I’m an artist and creative partner with my husband, Dean Lucker. I sell my paintings to individual collectors and we make small editions of mechanical artwork sold to shops and galleries. We also exhibit at fine craft shows nationally. Can you tell us a bit more about your blog Blue Hue Wonderland? Why did you name it that? The last five years have been a difficult time for me. Both of my parents were experiencing declining health and I was actively involved with their care. I had to put my needs on hold. This blog is my way of doing something positive for myself. I am enjoying sharing my interest in fashion with women and creating a place that documents this time in my life. I named my blog “Blue Hue Wonderland” because it grew out of this blue time in my life and the northern light where I live has a blue cast. The word ‘wonderland’ describes the quality I’m searching for when I make my photos. I see my style as an extension of my interest in art. Creativity has always been at the center of my life–it extends to my painting, gardening, interior design and fashion. I subscribe to some fashion magazines to keep current on style changes but follow trends in a low pressure way. I want my voice in fashion to be unique and timeless. From the first moment I saw your blog I was drawn to your beautiful coats? Can you tell a bit more about your fascination with coats? I live in a cold place. I love coats because I can wear simple outfits, then put on a coat and feel dressed. You combine color, texture and creativity yet always look supremely elegant? What is your style secret? Thank you so much. Color and texture are my speciality with my art so I think my years of experimenting naturally extends to how I see everything. I believe clothing can sparkle if one is wearing what truly reflects their unique spirit. It’s true that outfits look extra special when they are photographed beautifully and yours always are. Who takes your photos and how much work goes into producing them? I first think of the outfit I want to wear depending on the weather. Then Dean takes some quick pictures with the Ipad. I then adjust the accessories until I feel right about the combination. I do one post a week and I’m always looking for interesting backgrounds. We go to a site or two where I have a solid idea of the shots I want and Dean contributes his own perspective. Before I went to art school I studied commercial photography. As an artist, art is obviously omnipresent in both your environment as well as in your outfits. What is a good way for others to dress more artfully while at the same time preserving timeless elegance? I think one way to look more artistic is to purchase handmade jewelry. I think a simple dress with unique jewelry can look artistic. I like jewelry by Kenneth Cole available at Macy’s for a less expensive option. I recently asked the question on whether or not to go grey or not. You are a great example of someone who has both a great cut and color where your grey hair blends in with other colors. Can you tell a bit more of how you achieved that look? I have a wonderful hair stylist and I’ve been with her for 15 years. Gosh this is like a marriage! She foils my hair with three colors–the lightest is bleach, a medium blond and one darker tone. Since the base of my hair isn’t colored, some of the grey shows through. We have been talking at some point I will go gray, but for now this process is working. I cut and color my hair every seven to eight weeks. Can you tell me where you live and how your location influences your style? Is it very different from others in your area? I’m part of a vibrant arts community. People in my area generally dress in a conservative and casual manner with a good mix of stylish dressers. I try to wear colors that reduce the red undertone in my skin. When I shop I wear little makeup so I can see this. I’m also 5′ 4″ so I fall in between petite and regular sizes. It can be more of a challenge to find things I like in petites. Right now I’m attracted to blouses with bow ties, structured jackets and slim pants. I’ve notice some of the younger women wearing tights that reflect their hair color. For me, I like textured light colored tights, but these things are always changing. Definitely less skin showing. I don’t do many tops and jackets without collars or anything low cut. ‘Age appropriate’ just has so many negative associations for me. I like to think about ‘life style appropriate’. I need clothes with flair for my life choices. I am enjoying the variety of choices I see reflected in the many blogs of the 40 plus women. There’s many options depending on who you are. I’m less interested in following trends. In my daily life I am low key about clothes. I’m busy and work at my studio with paint and wood so I wear bright colored jeans and thrifted sweaters. 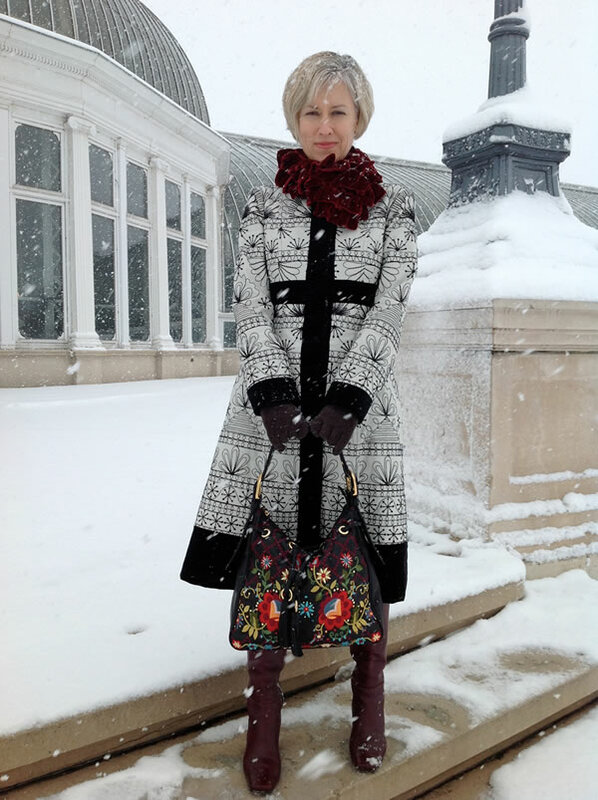 My blog shows outfits I wear to special events. The way I look tells others that I respect myself and have an unique voice and outlook on life. I like my green and pink post because it got me interested in wearing pink. I’ve never worn pink before so I purchased some pink jeans. I make the rounds, absorbing trends, picking and choosing. I like seeing more color and pattern mixing. Take some time for yourself if you can. Try that haircut or color you have been afraid to try. About every five years I cut my hair in a pixie for a change. If you see something in the store that delights your eye, try it on. You can always put it back on the hanger! I’m thinking short term for now. When I began I just thought about making the pictures. I know I’m still thinking about the next post. Thanks for asking me. I respect the blog you have created and I’m inspired by your style. Note from Sylvia: Thank you Ann. Lovely to learn more about you! 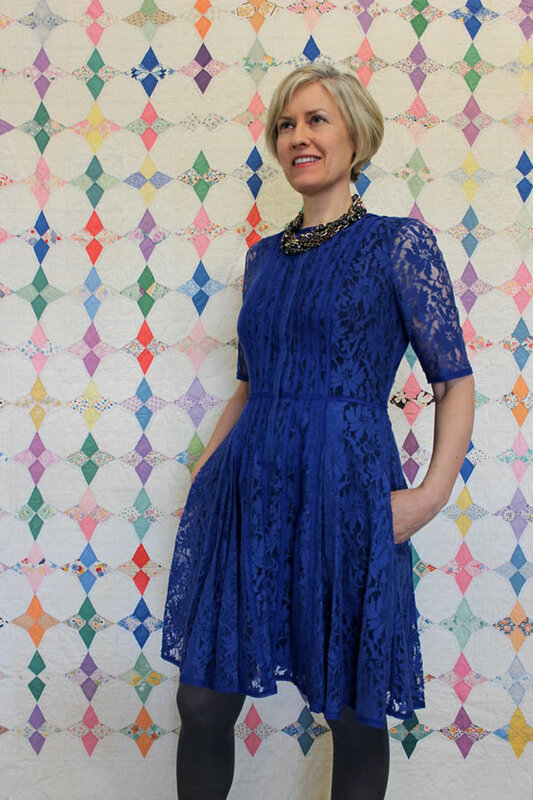 Be sure to check out her fabulous blog: Blue Hue Wonderland. Great interview. I love Anne’s artistic style. Great interview. I love Ann’s artistic style. 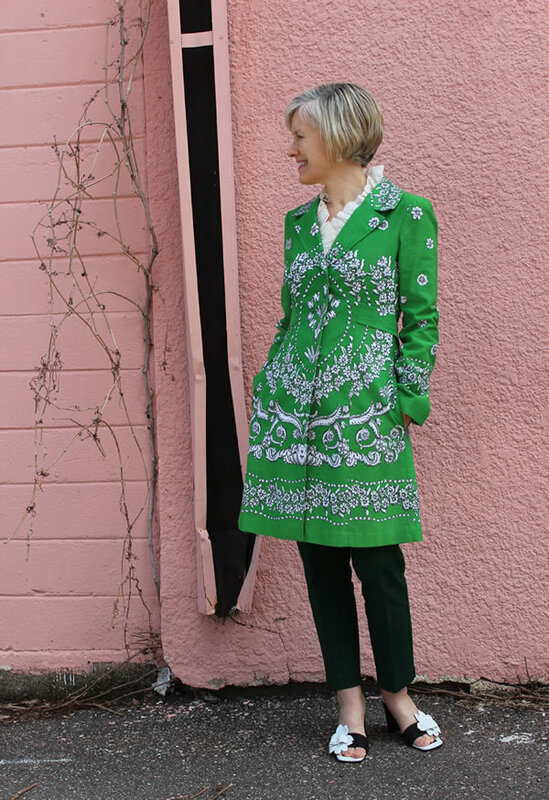 I am in awe of Ann’s beautiful jackets and coats. Where does she find them? I live in NYC and find all the coats and jackets tend to look the same after awhile. Very nice interview! I recently found Ann and really enjoy her wonderful images. Her style is classy & artsy and SO refreshing! I found Ann some time ago, and am a fan. I too love her coats and jackets, and her backgrounds are always interesting, unique and artistic. A gorgeous woman who is stylish and elegant. Sylvia, your interviews are always fascinating. Thank you. Love the interview & pictures. I recognize the Como Park conservatory in the 2nd picture, a local gem here in Minnesota. Fun to know Ann is a “neighbor”! Will have to follow her blog – thanks! Sylvia this is a gem of a post! Ann always does the most visual and stylish posts… seeing it all gathered here so cohesively is like opening a great little fashion magazine! Well done my dear, I so appreciate your hard work and effort! Thank you for letting us get a closer look into this wonderful woman’s life. I simply love how she is incorporating her love and background in art into her so called fashion blog, it such an inspiration. Ohhh there is so much to learn. I envy her for her creative skills. Lovely pictures and lovely outfits. Very elegant woman. Amazing how many wonderful bloggers there are over 40. And indeed… those coats.. gorgeous. Would not mind finding those. wow, another fabulous woman with flair! love her use of colors and prints without being swallowed and overpowered. i am into colors and prints as well and shall learn a lot from her. thank you sylvia for introducing her to your readers. Fantastic interview – I am a big fan of Ann! Thank you, Sylvia! I just followed Ann, too. Such creative style indeed and what a collection of coats – many Nanette Lepore pieces that I have loved over the years. Can’t wait to see more. Photos are something I’m working on, but you’re right – they do make a difference – and I don’t even have a photo of me on my blog. Great style here … elegance, sophisticated, and classy! Ann has such great style and great taste in coats. Marvelous feature. 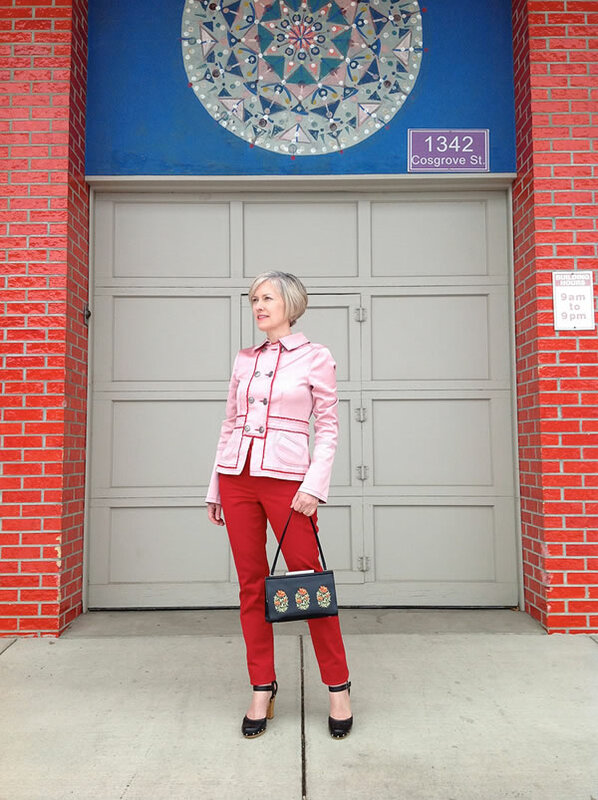 I am following Ann’s blog for a while now and every single post truly reflects her artistic and elegant style in her clothes, the location or background she has chosen for her photos or details like her shoes, jewellery and handbags. And obviously her fabulous coats are unique! They inspired me most as I live in Southern Germany and we have long winters and cool periods too. I have several neutral coloured coats and jackets – my new ones will only be colourful or even printed ones! Thank you for featuring Ann. Sylvia, thanks for allowing us to get to know Ann better! I have followed her blog since she started, and every post is such an inspiration to me. I love knowing how she chose her blog name. Please keep on with this series! I’m really enjoying it immensely. She is fantastic! A work of art herself! Next post: The style dilemma: go for one true safe style or experiment with different options and take risks?